Another Elephant Sanctuary (beside Kuala Gandah) is Sungai Ketiar. Here you can meet Suria, one of the host elephant (9) at the Sungai Ketiar Elephant Sanctuary. It's opened to the visitors since 2008. Suria and her mate Chahil, help captured and relocate wild elephants lost from their herd in the surrounding jungles. It's lovely to be able to see elephants in Sungai Ketiar. However, the word sanctuary reminds us that we are destroying the elephants habitat. The sanctuary is located along the Gua Musang - Kuala Berang road. The sanctuary has a commanding view of the Tasik Kenyir Lake in Terengganu. It's 1047 meters above sea level and it's about 52 kilometres away from the city of Kuala Terengganu. The natural habitat of elephants is preserved to ensure sustenance of its species. The sanctuary provides fun and excitement for the whole family. The best is to explore and observe the nature�s exotic flora and fauna while having the opportunity riding on the domesticated elephant�s back. Chalil is a bull elephant captured in Gua Musang (in Kelantan noted for its wildlife including tigers) in 2003 while Suria, the female jumbo, was ensnared in Bandar Permaisuri, Setiu in 2005. 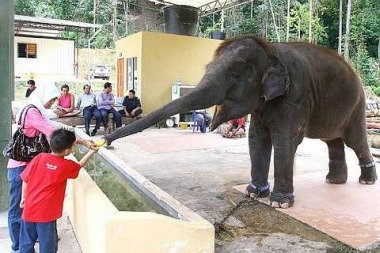 They are trained to be host elephants. Both are now tame enough to give free rides to visitors. They are fed with fruits, such as banana, sugar cane, bread, pellets and rice. Five times a day! There are also four trained rangers to look after the two elephants. The rangers let Suria and Chalil roam in the nearby jungle every four days. This enables the mammals to familiarise themselves with the jungle surroundings and also helps them to herd with the wild elephants in the area. When the elephants are not working or playing, they are indeed chained which is bit of a sad sight. Then tourists flock around the animals, feeding them carrots and sugarcane sticks. If you arrive around 4pm then you may sometimes get a chance to ride at the back of one of the elephants. Early in the morning is the best time to visit if you want to help out with some chores for a few hours. The sanctuary is an attraction, especially for motorists plying the Gua Musang - Simpang Pulai, Perak route. Since the opening it has attracted a lot of tourists, including those from Japan, the Netherlands, Germany and France. 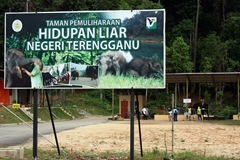 The Terangganu Forestry Department, which manages the sanctuary, is also protecting several salt licks for wild animals in the Simpan Tembat jungle.